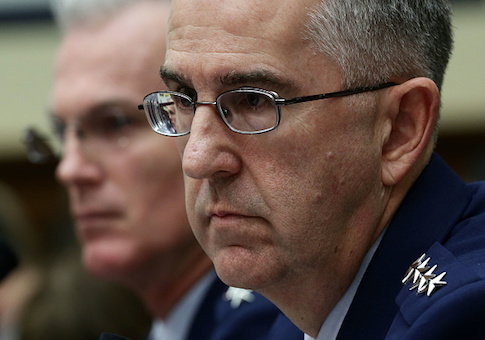 Air Force Gen. John Hyten, commander of the Omaha-based Strategic Command, told Congress he favors requiring limits on the new weapons in any extension of the 2010 strategic arms accord. The new arms Moscow is building outside New START include a nuclear-tipped drone submarine, an intercontinental-range cruise missile, and a hypersonic missile. The arms currently are not limited under New START, which will expire in two years. The testimony by the commander is a blow to arms control advocates, many of whom favor ignoring Russian treaty violations. Hyten, in testimony before the Senate Armed Services Committee, defended plans to spend tens of billions of dollars annually to modernize the aging U.S. nuclear arsenal. Nuclear threats are increasing and Hyten said all three legs of the nuclear triad need to be modernized to deter adversaries in the future. "I believe in peace through strength, not peace through unilateral disarmament," he said, echoing the Trump administration's Reagan-era defense strategy. Congress estimates the cost of modernizing and replacing nuclear arms and delivery systems will cost $1.2 trillion through 2046. New systems include Columbia-class missile submarines, a new ground-based ICBM, and the new B-21 stealth bomber. The four-star general said Russia is 80 percent complete with its strategic modernization while the U.S. modernization program is lagging behind. A major worry is that the United States has "lost the ability to go fast" in modernizing forces, Hyten said. On New START, Hyten said the treaty contains a provision requiring Russia to notify a bilateral consultative committee of all new strategic weapons, but Russia so far has failed to do so. "We see them developing capabilities outside of that treaty which is concerning to me," Hyten said. Russia announced plans last year to deploy new strategic weapons, including a long-range underwater nuclear drone code-named Kanyon by the Pentagon. The drone will be armed with megaton-sized warhead capable of destroying an entire port. Moscow also is building a long-range cruise missile powered by a nuclear reactor that was tested at least twice. The missile is designed to evade missile defenses and provide a long-range strike capability. Russian President Vladimir Putin announced this week a "breakthrough" in development of a new Avangard hypersonic missile capable of traveling up to 20,000 miles per hour. The missile will be deployed this year, he added. The Russian leader also issued a nuclear threat against the United States if new U.S. intermediate-range missiles are deployed in Europe. Hyten said he favors keeping Russia in New START and in the Intermediate-range Nuclear Forces treaty that Moscow violated by building a banned cruise missile. Russia violated the INF treaty for the past five years and has not responded to repeated U.S. diplomatic appeals to return to treaty compliance. As a result, President Trump announced Feb. 1 that the United States is withdrawing from the treaty in six months. Hyten said continued U.S. compliance with INF in the face of the Russian violation would be "tying our hands" in the face of the violations, and because China is not a party to the treaty that bans missiles with ranges between 300 and 3,400 miles. "I want Russia in that treaty, but if they won't comply, you don't really have a treaty," he said, adding that he does not think it likely Moscow will return to compliance. Hyten said he has discussed both the INF treaty violation and New START circumvention by Russia in meetings with the president. A senior Trump administration official said the United States, at a minimum, would seek changes to the New START treaty, including stricter verification, as a condition for renewing the accord. The START treaty will expire on Feb. 5, 2021 if it is not extended. The treaty limits each side to 1,550 deployed nuclear warheads. Hyten said the three weapons systems—the nuclear-tipped torpedo, new cruise missile, and hypersonic missile—should be included in any extended New START agreement. "If the Russians continue to build capabilities outside the New START treaty that aren't accountable and won't come to the table under the treaty … that causes me to have concerns," Hyten said. The New START provides two benefits to Strategic Command, he said. It limits Russian weapons and thus allows for better posturing of U.S. nuclear forces to respond to nuclear threats. Also, the treaty provides insights into Russian arms through verification. "But we don't have insight into all the other things that are going on right now," Hyten said, referring to the new weapons. If New START is extended, "I want, ideally in my view, to have all nuclear weapons be part of the next phase … and not just the identified weapons that are in the New START treaty now," he said. Convincing Russia to provide insight into the new arms will be "the challenge" for any New START extension, he added. On INF, Hyten said the State Department has reached out to the Russians on the violation "and the Russians are not answering favorably." Moscow has denied the new cruise missile violates the INF treaty and has charged Washington with violating the accord. Several senators questioned the Stratcom commander on hypersonic missile threats from China and Russia. Russia is "clearly moving aggressively in the area of hypersonics" by testing fully integrated systems for both long-range and medium-range strike weapons. China also is developing a hypersonic glide vehicle and has carried out at least seven tests of the missile launched atop a ballistic missile since 2014. Hypersonic missiles travel at speeds greater than 7,600 miles per hour and are regarded as destabilizing weapons. Hyten said the sole U.S. defense against hypersonic attacks is the threat of U.S. nuclear retaliation through the triad of 400 Minuteman land-based missiles, 14 nuclear missile submarines, and a fleet of 20 B-2, 60 B-1, and 76 B-52 nuclear-capable bombers. "If you look at the way a hypersonic missile works, the first phase is ballistic but a fairly short phase. That phase we will see … we will be able to see it came from Russia, it came from China," he said. However, once the hypersonic stage takes off "it basically disappears from our sensors and we don't see it until the effect is delivered," Hyten said. The military needs better sensors to be able to detect hypersonic attacks in order to better defend against them, he added. "You can't defend yourself if you can't see it," he said of hypersonic threats. A ballistic missile fired at the United States from either China or Russia takes about 30 minutes to hit a target. A Hypersonic missile, depending on the design, could reach the United States in 15 minutes or less, depending on where it is launched, Hyten said. "But it is more challenging than a ballistic missile," he noted. Most current U.S. missile defenses against high speed targets are designed to counter ballistic missiles and are unable to strike hypersonics that travel in a trajectory that skims above the atmosphere and is able to maneuver to avoid defense. Air Force Gen. Terrence J. O’Shaughnessy, commander of the Northern Command, testified along with Hyten. Democrats questioned O’Shaughnessy on whether he agreed with the president's decision to declare a national security emergency on the southern border to stem illegal immigration. The Northcom commander said he was not consulted on the decision but had numerous conversations with the president on the action. The general said he agrees with the need to protect the southern border. A border wall also would provide some military defense, he added. Sen. Richard Blumenthal (D., Conn.) asked O’Shaughnessy what is the national security threat from the southern border that justifies declaring what he termed a "fake" national emergency. "What I see from my perspective is that a secure border will reduce threat to the homeland," the general said. Sen. Dan Sullivan (R., Alaska) challenged Blumenthal by noting that 72,000 Americans died from opioid-related deaths last year, and 90 percent of the heroin entering the United States comes through Mexico. "If that isn't a national emergency—72,000 dead Americans killed by opioids and heroin in one year, I have no frickin' idea what an emergency is," Sullivan said. "Clearly this is a national issue that we have to take on with a whole-of-government approach," O’Shaughnessy said. Hyten said he supports setting up a new Space Force but that modernizing the nuclear arsenal is an urgent priority. Mark Schneider, a former Pentagon nuclear policy maker, said he agrees with Hyten that Russia is circumventing New START. "In addition to the systems he mentioned, I would add the rail-mobile ICBM program and the Tu-160M2 bomber," he said. The bomber variant has been described in state-run Russian media as a "new bomber in all but name."